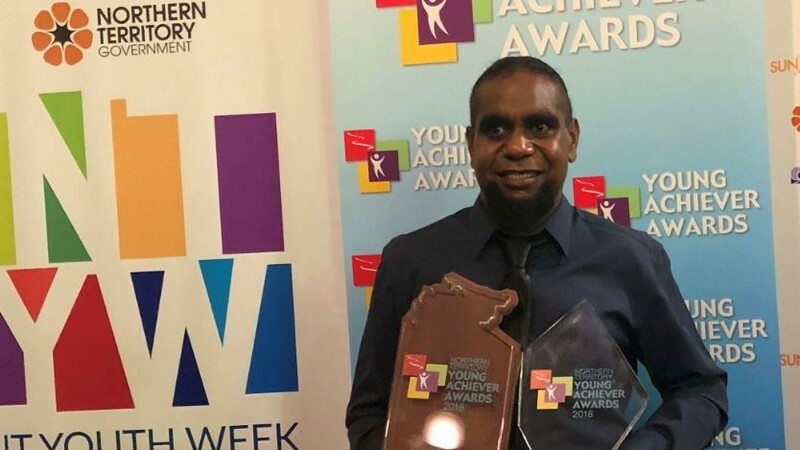 Titjikala School Assistant Teacher Roger Wilyuka won the 2018 Northern Territory Young Achiever of the Year and the Young Aboriginal Educator Award at the NT Young Achiever Awards. Roger was recognised for his positive attitude and strength of character, which has made him a successful educator within the Titjikala community. Roger is dedicated to education in his community, working as an Assistant Teacher in the school’s Transition class, running the fathers and sons reading program and school holiday activities and sports program. “I also really love working with the young kids at my school. It is great for me to be teaching them. It is most important to be encouraging the younger ones in school and to be working with them one on one,” said Roger. Roger was acknowledged for his outstanding commitment to teaching and learning and for inspiring his peers, students and community by bringing positivity and creativity to his role. The award recognises the many young Aboriginal teachers, assistant teachers, support staff and students who are making a positive impact on the education of students at Territory schools. Aboriginal educators and support staff like Roger play a crucial role in the lives of their students, making a real difference by supporting teaching and learning, giving them guidance and support, and providing a bridge from schools to families and communities. Roger was also the winner of the Regional and Rural Initiative category of the 2014 Young Achiever Awards and this year was one of 15 Aboriginal educators nominated from across the Territory.